A Standards Library is simply a Draft inside a Project which has the “Is Standards Library” checkbox set. 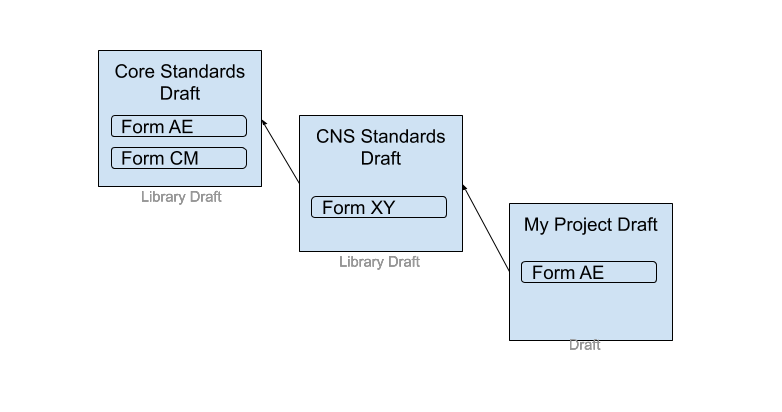 Every Draft can have one Standard Library set making a chain of standard libraries back to a root or top-level library. The Standard Draft tree is a mechanism for determining compliance to the standard. For each object in a Draft ( a Form, Edit Check etc) TrialGrid follows the tree “up” back to the root looking for an object of the same name to compare to. If the object is not found or if it is different from the standard definition then this should be explained. Note that TrialGrid does not enforce copying objects from the Standard library. 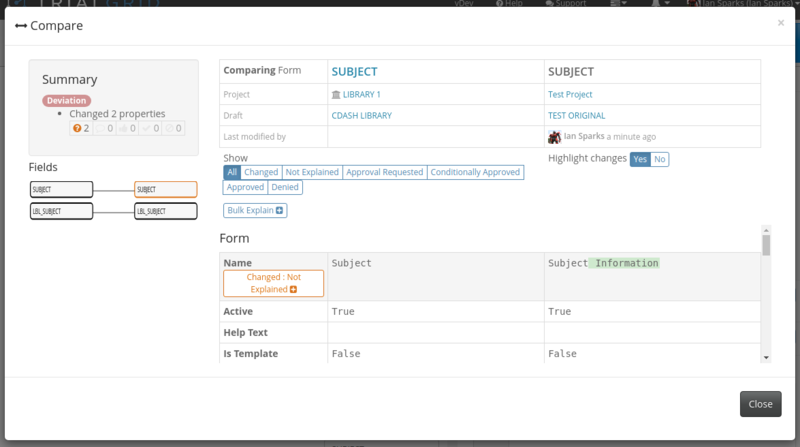 It is often convenient for the Study Builder to copy definitions for Forms or Edit Checks from a previous study. TrialGrid provides assurance that whatever the source, the object matches the selected Standard library. This approach provides the Study Builder with freedom to design in the most efficient way for them while also tracking standards compliance with no extra effort. If an object has been changed from the standard definition then it is helpful to understand what the changes are so that these can be explained and approved for the study. TrialGrid provides a side-by-side color-coded comparison of objects in text form so that the differences can be quickly identified. Changes are highlighted in yellow, deletions are highlighted in red and additions in green. An audit trail is kept of the explanations and approvals for deviations from the standards. A summary of compliance metrics is available on the Standard Compliance page. This page shows the overall counts of objects found in the Standard Library Drafts vs how many were not found because they were new or were changed. A PDF report of the summary can be generated from the same page.